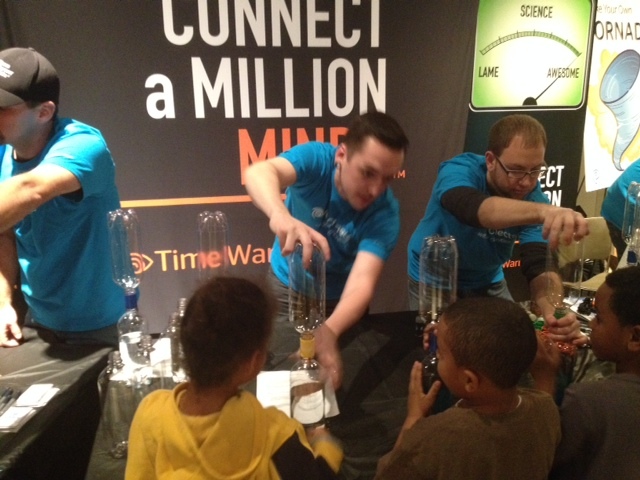 In November, 2014, Time Warner Cable was the presenting sponsor of the inaugural “Capital Region Science Festival” hosted by long-time Connect a Million Minds partner miSci – the Museum of Innovation & Science in Schenectady, NY. Working closely with miSCI, TWC helped recruit its non-profit STEM partners from throughout the region to make this weekend-long event a resounding success with 3,000 visitors and more than 30 exhibitors. Families got a chance to explore nanotechnology, robotics, 3D printing, chemistry, astronomy and more. TWC’s signature exhibit area featured both Connect a Million Minds as well as TWC News so visitors could learn about the science of meteorology as well as the science behind TV production. It also gave the kids the chance to play TV meteorologist for a day reporting on one of two scenarios – a polar vortex and Hurricane Sandy. 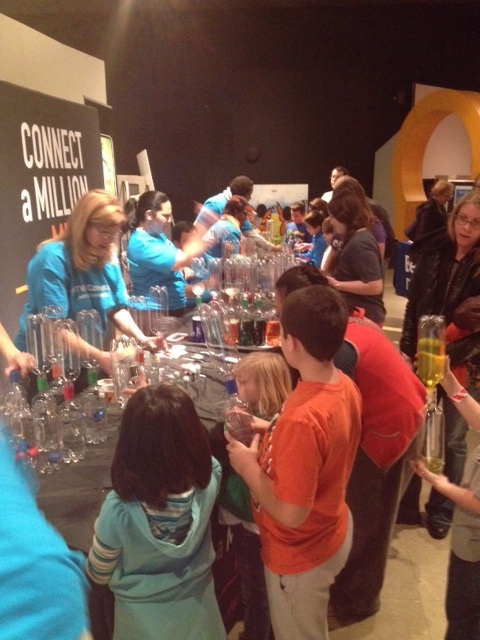 By far, one of the most popular hands-on activities was the TWC “vortex in a bottle” where kids worked with 30 enthusiastic TWC employees to create their own takeaway “tornado in a bottle” experiment. For me, the most crucial symbol of success was the integration of TWC News and our non-profit partner relationships in the region coupled with our highly-engaged volunteers and miSCi, the premiere children’s museum in the region. Lastly, TWC Chairman and CEO, Rob Marcus stopped by with other TWC senior leadership to experience first-hand our employees giving back to the people in the communities in which they live and work as well as witnessing the significant impact our Connect a Million Minds initiative has on committed partners such as miSCi. Plans are already underway to make the second annual Capital Region Science Festival bigger and better next year – and a request has been made by the families to “bring back the tornadoes!” In addition, local TWC employees are continuing to inquire about future opportunities at the Museum – another sign of success!